Filling the day with natural light and the night with true darkness for as little as a weekend can have a profound impact on how well we fall asleep and stay asleep, according to new research from the Colorado University. Previously, to study the impact our modern light-filled environment – or lack thereof – has on our clock, Wright for a 2013 paper sent volunteers camping for a week in the summer. They were exposed to four times more light by day than usual and prohibited from using headlamps or flashlights at night. Upon return, the onset of melatonin – a hormone which promotes sleep and physiologically prepares the body for nighttime – came nearly two hours earlier, near sunset. It began to wane, signaling the biological day, earlier too. In essence, the campers’ clock synced with the summer sun. In the first, his team recruited 14 volunteers: 9 went camping in Colorado’s Eagle’s Nest Wilderness for a summer weekend; 5 stayed home. When the campers returned after just two days and had their saliva tested, their melatonin rise had shifted 1.4 hours earlier. For the second study, five volunteers went camping for one week in Colorado’s Cache La Poudre Wilderness near the time of the winter solstice and returned to the lab to have their melatonin tested hourly for 24 hours. Measurements showed they had been exposed to a whopping 13 times as much light by day as in their typical weekday environment during winter. While camping, they went to bed earlier and slept longer. Upon return, their melatonin levels began to rise 2.6 hours earlier. Without being thrown off by artificial light, their biological night had naturally lengthened to align with the season – as it does with many animals. “This has been assumed but never demonstrated,” Wright said. Even after a weekend of camping, people have to keep a regular wake and sleep cycle in order to retain the circadian reset they’ve gained, he said. 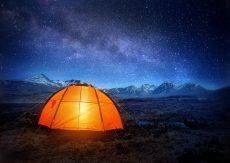 For those who want to get their circadian rhythm back on track, but can’t get away for a camping trip, Wright suggests getting more bright natural light by day and shutting off smartphones and laptops well before bedtime.